1) According to a recent press release, visitor numbers at this year’s fair were roughly around the 45,000 mark — a number that is close to that of last year’s attendance. There were over 180 galleries present at the fair. 3) Galerie Elba Benitez was awarded the Frieze New York Stand Price for their solo showing of Carlos Bunga. 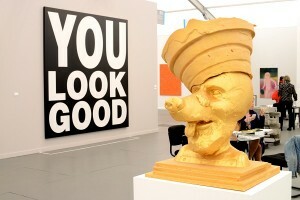 According to Frieze, they were awarded a total of $15,000. 4) According to artmarketmonitor.com, London-based curator and artist Anita Zabludowicz is now the proud owner of Michael Williams’ Morning Meditation with Mud and Jenny Mac, after spending nearly $25,000. 6) Paul McCarthy’s Balloon Dog wasn’t the only artwork that sold for $950,000, Walton Ford’s Tri Thong Minh, a wall-sized watercolor piece, proved to be just as lucky. 7) According to a Frieze press release, the overall response from galleries present at the fair was immensely positive: “Sales were fantastic. Collectors love this fair, it’s dynamic, high quality and offers an experience no other fair provides. We are really happy with the feedback, the sales, and the amount of curators and writers. It’s really a perfect fair,” Lisa Spellman of 303 Gallery said. Photos by Aehee Kang Asano/GALO Magazine as well as courtesy of Frieze.